How to Burn PS2 Games, Burn XBox Games and Burn play station 2 Games? GAME CLONER helps you, whatever they are! Need Computer Games for Mac, Hot Mac Games Click Here! 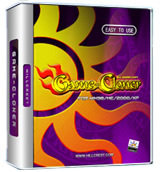 Need Pocket PC Games, Hot Pocket PC Progarm Click Here! Are you ready for an exciting quest of adventure and discovery? Embark on a journey around ancient Greece, Babylon, Carthage, Egypt and Rome in the search for one of the greatest mysteries of all time - the lost city of Atlantis. In this classic style matching game with a dazzling new twist you will need to discover pieces of ancient artifacts that will help you find a way to your destination. A teenager who has a mission - to save his girlfriend Rachel from the claws of a big, bad alien! One day Bud and Rachel were walking in a park when suddenly some strange green-furred creature jumped out of a bright flash of light. The creature grabbed Rachel and ran into the light which then disappeared. Your goal is to defeat the Mad Sorcerer (first episode - stage with 1 on 100)and the Ghost (second episode - stage with 101 on 200). The Mad Sorcerer is located on 100th level. The Ghost is located on 200th level. Various monsters on each level will try to stop you, so your journey will not be so easy. Do you think you can play Tetris well? Well, this new tetris game will challenge you! You will have to apply the best of your skills to be successful in this one and we are sure you will not be bored! The rules of Challenger Tetris are similar to those of a regular tetris game, however here you will not only be putting the blocks in nice even layers but also going through levels that contain various tricky tasks. Luxor Game - As addictive as it is exciting, Luxor Game is an action-puzzle game that takes you on a thrilling adventure across the lands of Ancient Egypt. The mysterious goddess, Isis, has enlisted you to battle Set and his evil minions. With 88 mind-blowing levels, the challenge will not be an easy one. This game represents a brilliant example of puzzle-tetris blend. Now colorful blocks and bricks falling from above give even more fun - you can move them, change their position and plan your Triumph using your brilliant tactics! Enjoy three different play modes, original sound-track and rich graphics. Magic Ball Game - Play Magic Ball is a highly addictive Arkanoid remake that won't let you go outside for at least a week once you install it. Unlike other Arkanoid clones, Magic Ball prides itself with professional 3D graphics, studio-level sound effects, awesome original soundtrack and well-designed gameplay with tons of new brick types, bonuses and special effects. Platypus Game is one of the most unique looking games ever created. All of its visuals were created using photographed plasticine (clay). Help the peaceful land of Mungola defend themselves against the attacking hordes of Collosatropolis!